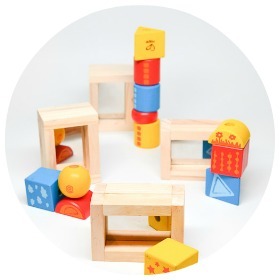 There is always a place for a set of wooden blocks in a playroom, and we like playing with them. 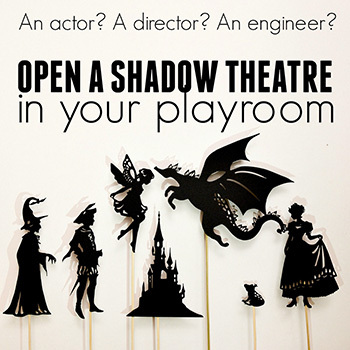 Specialty blocks – with transparent windows, sand and water in them – add a new dimension to the play, and for a Christmas gift this year, I have prepared a handmade version of mirror blocks for my son. These blocks were inspired by a beautiful tutorial on how to make colour blocks by And Next Comes L. Like Dyan there, I have been admiring colour blocks for a while, but was deterred by the price . 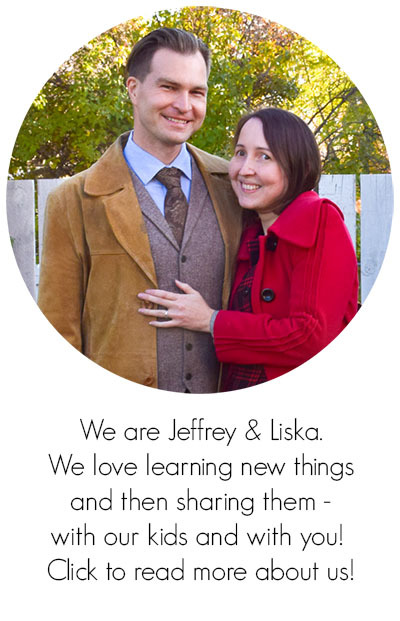 Then I saw a tutorial on her site and jumped with delight! I could make my own colour blocks for under three dollars. So I did last year for Christmas, and they were a lot of fun. 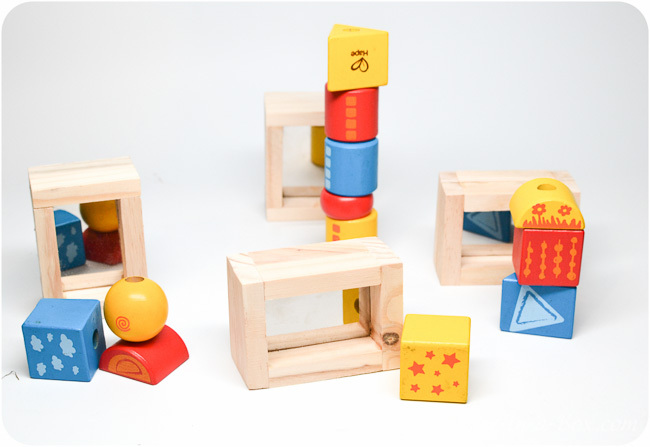 Specialty blocks may seem like a gimmick at first glance, but children really enjoy playing with them. My son and his best friend often grab a couple of colour blocks and run around, looking through them. Later this year, at the thrift store, I saw a pack of shimmering water blocks mixed with crystal bead blocks . I got them, and Budster welcomed this new addition to our wooden block collection. I cannot quite describe the way he played with them, but he did on many occasions when he ignored his usual blocks. It is mesmerizing to watch water move in the water block, and at times it seemed like he simply liked to sit and watch them. But of course, he also stacked them and made wooden block constructions. So I started thinking of getting him a set of mirror blocks for Christmas this year. 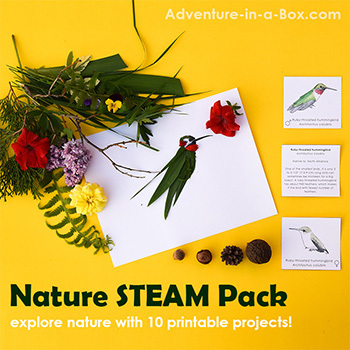 I had found some, and was just about to put them in my cart… when I realized that they would be so simple to make! So I did. My price for them turned out to be under seven dollars. 1. 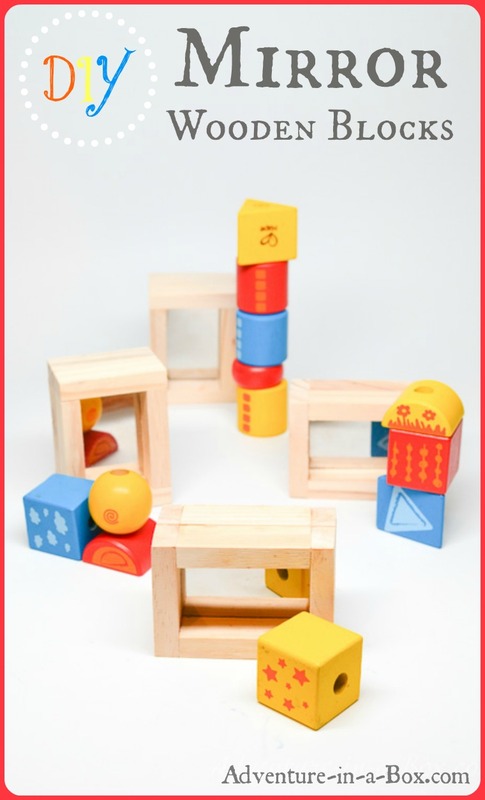 For making one mirror block you will need eight wooden blocks out of the tumbling tower box and two pieces of mirror sheet. 2. 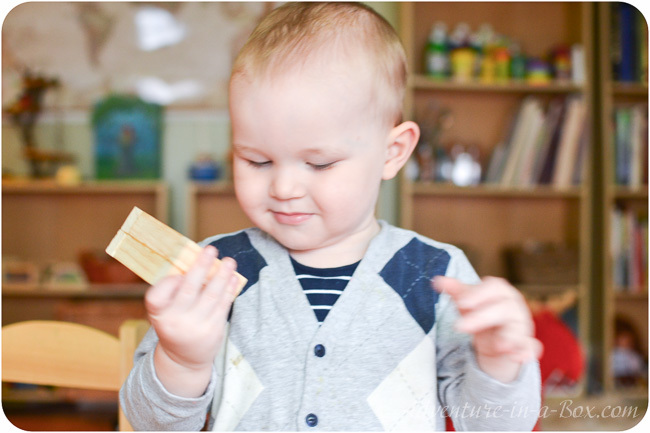 Using eight wooden blocks, make two equal rectangles, as shown on the picture, and glue them with the wooden glue. Let the frames sit for a couple of minutes, then wipe the excess of glue off. Let them dry. 3. Cut two equal rectangles out of mirror sheets. 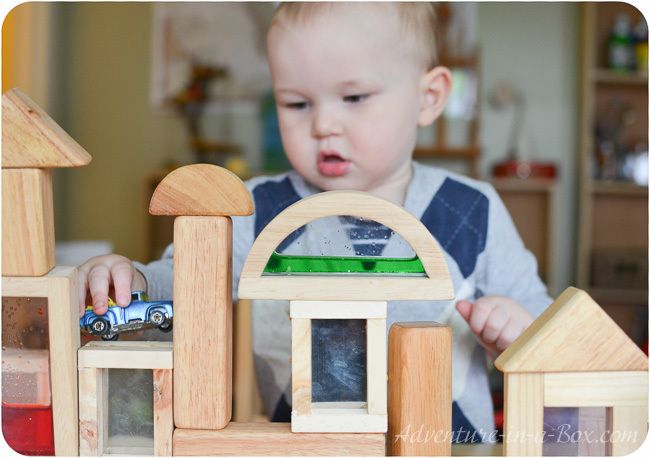 Their size should be just a little bit bigger (1/8″) than the hole in the middle of your wooden blocks. Glue them together with mirror sides out. 4. 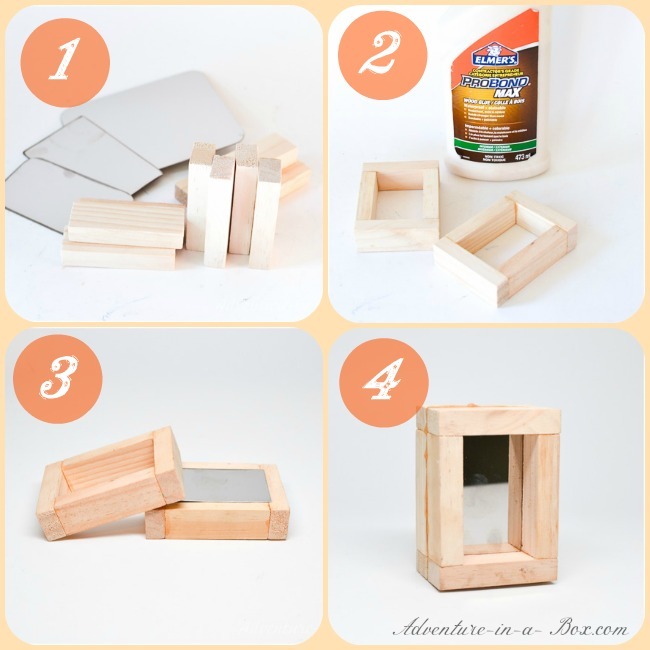 Put the mirror sheet in between two wooden blocks and glue them together. 5. (optional) If you have a sander, you may want to sand the edges for extra smoothness. Even though I am planning to give these blocks to Budster for Christmas, I could not resist showing them to him once before packing away. Look at his delight at seeing his reflection in the mirror! It made me think that mirror blocks could be a good gift for babies who like to smile at their ownreflection. Budster sure did. 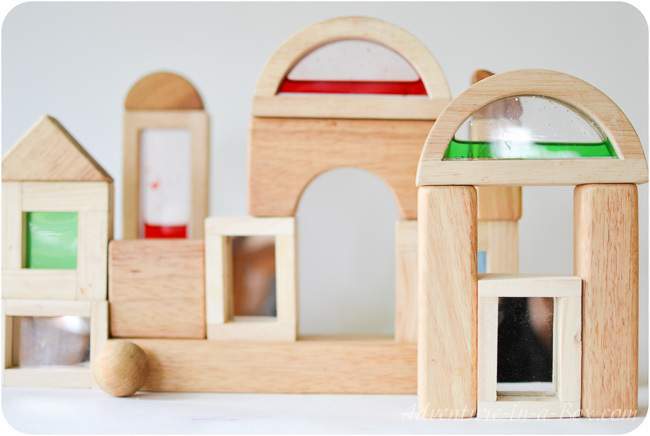 These mirror blocks would also work well in a Reggio Emilia inspired classroom. Then we unrolled some construction work on the table, using all of our blocks. It was pretty impressive! Budster brought cars over so that they could have a look at their reflections, as well. Check out the green block on the left! That is from a set of coloured blocks made according to instructions from And Next Comes L. A set of blocks with coloured films and mirrors would make a wonderful handmade gift. What a great find to find those water blocks at the thrift store! I used to think these kind of blocks were gimmicky, like you said, but even I’m fascinated with them now. What holds me back is the price too – I love how you’ve made these seem easy and definitely affordable! 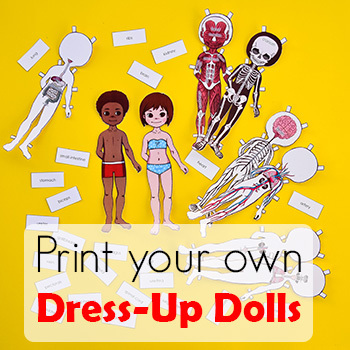 You are so clever – these are so much cooler than anything you could buy!